We are proud to introduce design enhancements of our proprietary patient tracking tool, Archway Carelink, a software platform part of our bundled payment management suite. The updates and enhancements reflect specific client feedback and address elements specifically requested. We are committed to continuously improving our platform to make sure that our clients have the best tools and resources to succeed in bundled payments. The design updates were made in collaboration with a leading user experience firm, UXL. 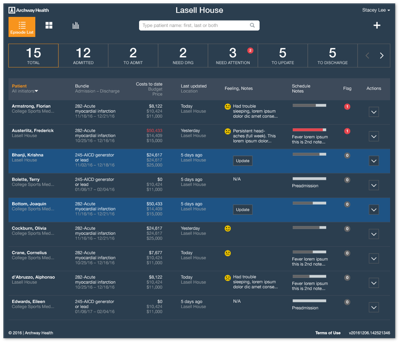 With this redesign, we developed an interactive, comprehensive dashboard for patient monitoring. It includes a streamlined episode list and an episode record, which tracks patients throughout the care journey. The new Carelink platform includes changes to the tactical dashboard made based on users’ feedback; the original text-only dashboard was updated for usability to better engage program managers and nurses monitoring patients at facilities, and make it easier for them to use the platform and glean insights. In this update, we also streamlined the episode list, a key part of our tracking tool. Now, it extracts the most relevant data and organizes it in a clear and digestible hierarchy of information. This allows the users to more easily search, filter and parse patient data, and ultimately, more efficiently monitor patient information. We added new features to our messaging capabilities via text in this update to help maintain patient communication. Now, Carelink will ask patients to numerically rank how they are feeling. In the event that the patient is not feeling well, Carelink will automatically respond with information to contact their care coordinator. With this update, care coordinators can keep a better eye on patients at home and help avoid any adverse outcomes. All of our redesign efforts were made with the user in mind. Our goal is always to make our platform easier and more desirable to use. Based on user interviews and feedback, we developed a final product that simplifies usability, improves efficacy, and has a strong visual direction for this application and all on-going advancements. At Archway, our patient tracking tools are a key component that contributes to our service of ensuring success for providers in bundled payments. We believe these tactical and user-friendly updates to our platform will improve the experience of both the provider, and the patients their care for. And, as always, please let us know any feedback on the platform. WATERTOWN, Mass.--(BUSINESS WIRE)--According to a survey conducted by Archway Health – a Boston-based firm specializing in managing bundled payments programs – participation in bundled payments has improved the quality of care, and anticipation and preparation for new programs remains high. The survey assessed the perceptions and efficacy of bundled payments ahead of the expected announcement of a new bundled payments program from the Centers for Medicare and Medicaid Services (CMS). The survey results are based on responses from 70 participants across the U.S. The participants, which included executives, administrators and clinicians, represented the continuum of healthcare from hospitals, specialty care, post-acute facilities and home health care. 75% of respondents say involvement in these programs has improved quality of care, whether it lowered costs or not. 63% of respondents say bundled payments has both improved quality and lowered cost. The most prominent reason for not participating in bundled payments was the potential administrative burden. No respondents cited a limited return on investment as a reason for not participating. As CMS is expected to release a second generation of Bundled Payments for Care Improvement (BPCI), 75% of respondents are “definitely” or “probably” planning to participate. When it comes to bundled payments, 25% of healthcare professionals say they are “100% ready” to implement them, while 56% are “getting prepared” or “just started the process” with more to do. Since its inception in 2014, Archway Health has been active and solely focused on bundled payments. Specialists and providers partner with Archway to receive guidance on how to navigate every step of bundled payments participation. To learn more about bundled payments, the survey, the anticipated new CMS program and how it impacts providers, please contact info@archwayha.com. Archway Health, founded in 2014 and built on a deep foundation of healthcare payment reform expertise, works with providers to design and execute care and risk management initiatives that drive success in bundled payment programs. Archway is currently working with leading healthcare providers participating in the CMS BPCI and OCM programs, as well as with commercial payers operating bundled payment initiatives. To support these programs, Archway works with providers to analyze their opportunities and risks and to deploy its comprehensive platform of analytics, patient tracking tools, and advisory services to ensure their success in bundled payments. For more information, please visit www.archwayhealth.com.